Welcome to “In the Community,” this is a listing of the various meetings, events and activities that I will be engaged this fall. Attending these meetings and events allows me the ability to meet with a wide variety of business leaders, citizens and other elected officials. If your schedule allows please join me and be sure to say hello. All of these meetings and events are open to the public and you are more than welcome to attend. For complete details contact Raquel @ raquel@kevincameronfororegon.com or 503.269.0915. Boys and Girls Club of Marion Polk Counties Inspiring and enabling all youth ages 6-18, especially those who need us most, to rea lize their full potential as productive, responsible and caring citizens through the development of a positive self-image and self-reliance. 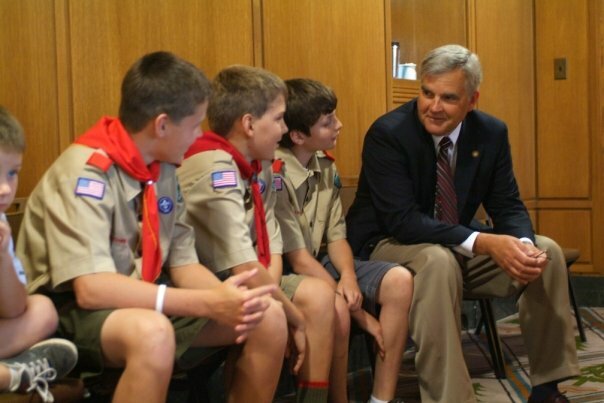 Cascade Pacific Council Boy Scouts Provides services and youth-development programs to families and community organizations in eighteen counties of northwest Oregon and southwest Washington states. Corban University Business Executives Corban University is an independent Christian university in Salem, Oregon, with more than 50 majors and programs of study including professional, liberal arts, and ministries. CUBE is a new endeavor to connect current students with alumni and local business leaders. Family Building Blocks FBB serves families with infants and young children who are struggling with difficult life circumstances. Our goal is to provide early intervention that builds successful and resilient children, strengthens parents, and preserves families through an array of comprehensive and integrated early childhood and therapeutic family support services. Liberty House Marion County’s only child abuse assessment center providing special assessment services in a safe, comfortable, child-friendly environment. Since 1999, Liberty House has provided child-focused, high quality assessment services to children when adults are concerned that they may have been hurt by sexual abuse, physical abuse or neglect. With compassion and expertise, medical providers conduct complete medical examinations for the children coming to Liberty House. Marion Polk Food Share Working in partnership volunteers, the board of directors and MPFS staff provide adequate sustainable resources and programs to meet the hunger needs of our community, both residents and visitors while working together to identify and eliminate the root causes of hunger. Morning Star Community Church A worshiping family, growing in our faith, loving God and neighbor, serving with our gifts, sharing with the lost…all for the glory of Jesus Christ. Operation Love Boxes Providing boxes filled with goodies and encouraging notes to our troops abroad. Marion County Reentry Council Inmates face many challenges upon release prison. Ensuring to the greatest degree possible that offenders have the tools they need to be successful after their release from custody serves a fundamental public safety interest for Oregon’s communities. Many of our local and state agencies share a common mission in protecting the public’s safety. We are challenged to identify ways to break down the barriers that are faced by those who are released from our custody so that they have the opportunity to be productive members of society who do not return to criminal activity. Salem Area Chamber of Commerce This organization is about innovation and relevance. A talented and committed staff help make their members more successful in the pursuit of their business objectives. Salem Area Young Life A disciple based organization lead by adults concerned enough about kids to go to them, on their turf and in their culture, building bridges of authentic friendship. Through time, patience, trust and consistency lives are changed. Salem City Club Established in 1967 for the purpose of engaging the local community in conversations, topics and issues that inspire all to be better informed members of the community. SCC is a volunteer led organization and are dependent upon member and community support to further our mission. Salem Keizer Schools Foundation A catalyst for the enhancement of the education and development of all Salem-Keizer youth by providing resources for creative and innovative programs and materials, educating and mobilizing the community, and sustaining collaborative partnerships that support its goals. Salem Leadership Foundation Engaging People of Faith and People of Goodwill to transform the community, neighborhood by neighborhood. We Build Bridges among Stakeholders: people, churches, schools, agencies, cultures, business, non-profits, and neighborhoods. THE MID-WILLAMETTE VALLEY ABSOLUTELY OREGON! From minor league baseball to bird sanctuaries, covered bridges, acres of gardens, world renowned vineyards to memorials honoring our soldiers and veterans, Marion County offers an expansive array of attractions, events and activities year round for the entire family. Featured below are the twenty-two cities in our county and at least one of their famous homegrown activities! Gates is a quiet town on Hwy 22 heading east. During the summer they host a weekly Saturday Market and it is home to river front recreation along the North Santiam River. Idanha’s Annual Community Potluck held in the summer is a testament to small town Americana. Located east of Detroit on your way to Sisters Idanha has river front recreation opportunities along the North Santiam River. Be sure to stop in at the Idanha Grill located at 183 Santiam Hwy Idanha, OR 97350, you won’t be disappointed. St. Paul located northwest vicinity of Marion County, parallels the Willamette River and the French Prairie. It is home to the Annual St. Paul Rodeo held over the Fourth of July weekend. It is surrounded by lush farms with flat prairies and rolling hills providing visually stunning vistas.